Posted on 12, February 2016 by EuropaWire PR Editors | This entry was posted in Russia, Security & Safety, Technology and tagged Carbanak, cybercriminals, GCMAN, Kaspersky, Metel. Bookmark the permalink. MOSCOW, 12-Feb-2016 — /EuropaWire/ — A year after Kaspersky Lab warned that cybercriminals would start to adopt the tools and tactics of nation-state backed APTs in order to rob banks, the company has confirmed the return of Carbanak as Carbanak 2.0 and uncovered two more groups working in the same style: Metel and GCMAN. They attack financial organizations using covert APT-style reconnaissance and customized malware along with legitimate software and new, innovative schemes to cash out. The Metel cybercriminal group has lots of tricks in its playbook but is particularly interesting because of a remarkably clever scheme: by gaining control over machines inside a bank that have access to money transactions (e.g. the bank’s call center / support computers) the gang can automate the rollback of ATM transactions. The rollback capability ensures that the balance on debit cards remains the same regardless of the number of ATM transactions undertaken. 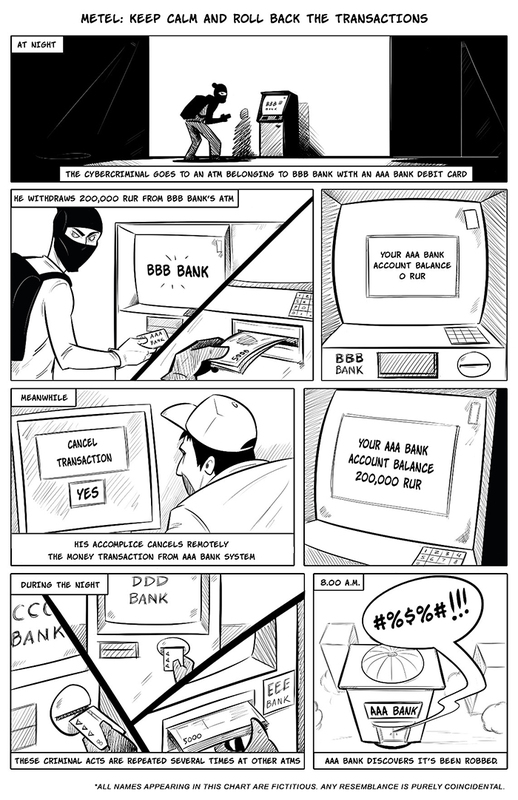 In the examples observed to date, the criminal group steals money by driving around cities in Russia at night and emptying ATM machines belonging to a number of banks, repeatedly using the same debit cards issued by the compromised bank. In the space of just one night they manage to cash out. “Nowadays, the active phase of a cyberattack is becoming shorter. When the attackers become skilled in a particular operation, it takes them just days or a week to take what they want and run,” commented Sergey Golovanov, Principal Security Researcher at Global Research & Analysis Team, Kaspersky Lab. During the forensic investigation, Kaspersky Lab’s experts uncovered that Metel operators achieve their initial infection through specially crafted spear-phishing emails with malicious attachments, and through the Niteris exploit pack, targeting vulnerabilities in the victim’s browser. Once inside the network, the cybercriminals use legitimate and pentesting tools to move laterally, hijacking the local domain controller and eventually locating and gaining control over computers used by the bank’s employees responsible for payment card processing. The Metel group remains active and the investigation into its activities is ongoing. So far no attacks outside Russia have been identified. Still, there are grounds to suspect that the infection is much more widespread, and banks around the world are advised to proactively check for infection. All three of the gangs identified are shifting toward the use of malware accompanied by legitimate software in their fraudulent operations: why write a lot of custom malware tools, when legitimate utilities can be just as effective, and trigger far fewer alarms? But in terms of stealthiness, the GCMAN actor goes even further: sometimes it can successfully attack an organization without the use of any malware, running legitimate and pentesting tools only. In the cases Kaspersky Lab’s experts have investigated, we saw GCMAN using Putty, VNC, and Meterpreter utilities to move laterally through the network till the attackers reached a machine which could be used to transfer money to e-currency services without alerting other banking systems. In one attack observed by Kaspersky Lab, the cybercriminals stayed in the network for one-and-a-half years before activating the theft. Money was being transferred in sums of about $200, the upper limit for anonymous payments in Russia. Every minute, the CRON scheduler fired a malicious script, and another sum was transferred to an e-currency accounts belonging to a money mule. The transaction orders were sent directly to the bank’s upstream payment gateway and did not show up anywhere in the bank’s internal systems. And finally, Carbanak 2.0 marks the re-emergence of the Carbanak advanced persistent threat (APT), with the same tools and techniques but a different victim profile and innovative ways to cash out. In 2015, the targets of Carbanak 2.0 are not only banks, but the budgeting and accounting departments of any organization of interest. And in one example observed by Kaspersky Lab, the Carbanak 2.0 gang accessed a financial institution and proceeded to alter the credentials of ownership for a large company. The information was modified to name a money mule as a shareholder of the company, displaying their ID information. Kaspersky Lab products successfully detect and block the malware used by the Carbanak 2.0, Metel and GCMAN threat actors. The company is also releasing crucial Indicators of Compromise (IOC) and other data to help organizations search for traces of these attack groups in their corporate networks. For more information. We urge all organizations to carefully scan their networks for the presence of Carbanak, Metel and GCMAN and, if detected, to disinfect their systems and report the intrusion to law enforcement.